For Restaurant Week stop #3 I choose Harvest for me and 3 of my girlfriends. It’s rare that I cross the Charles into Cambridge but force myself to do so for the sake of a great meal. If you weren’t looking for Harvest I’m not sure that you’d find it. Off of Brattle Street in Harvard Square, the neon sign (completely uncharacteristic of the venue) deep within an off-street walkway led us to our destination. Bread: I love when they offer more than one type! Bite size pieces of cornbread, raisin bread, and a plain rustic were served with a side of softened butter. 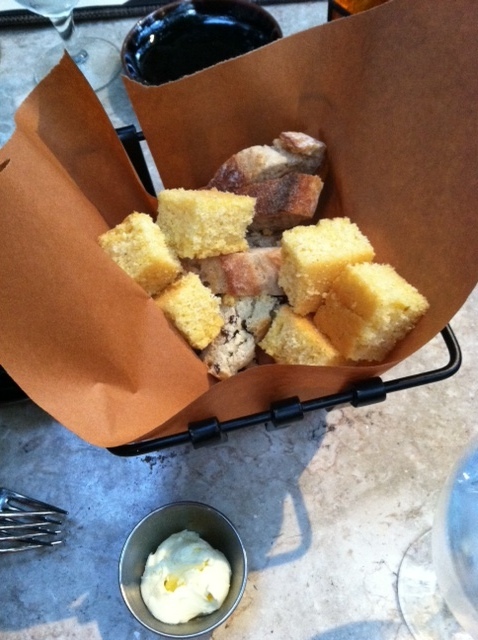 I of course tried each one and all were good, but the cornbread was the best, especially with the butter. Menu: The menu itself was placed inside a study booklet made out of material which matched the patio furniture. It differed slightly from the online RW menu (I really wanted that mocha semifreddo!) so we were thrown for a small loop, but I think everyone was confident with their decisions. 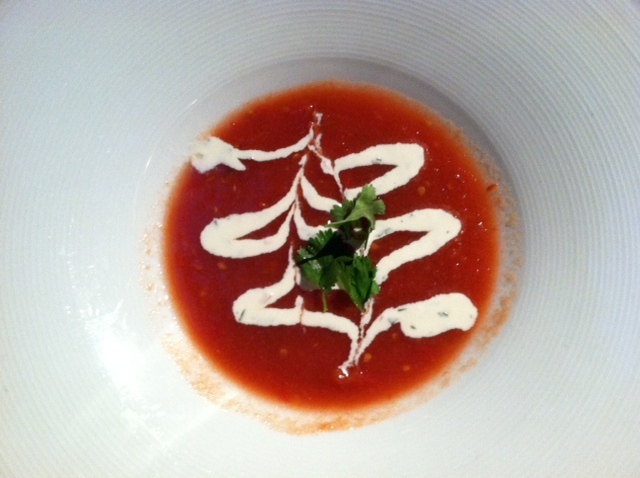 The chilled soup was served in a large but shallow bowl and decorated with crème fraiche and a few cilantro leaves – definitely the prettiest gazpacho I’ve ever seen. I’m used to having chopped veggies in gazpacho but this soup was all tomato, as if the tomatoes had been mashed and liquefied (you can see some seeds floating around in there). Light & refreshing, just wish there was more to it. I’m not a huge mushroom fan but the chicken and red fish options just didn’t excite me. 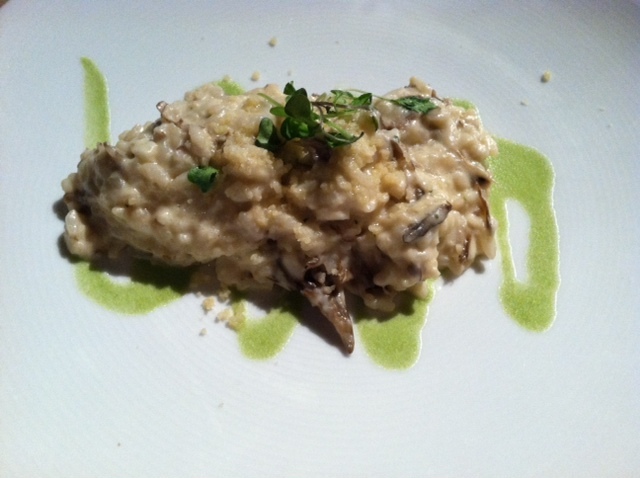 Risotto however does excite me and I’m glad I ordered it. A perfect portion, cheesy but not too rich, full of flavor, and just the right amount of mushrooms for someone who generally fears them. Really excellent! 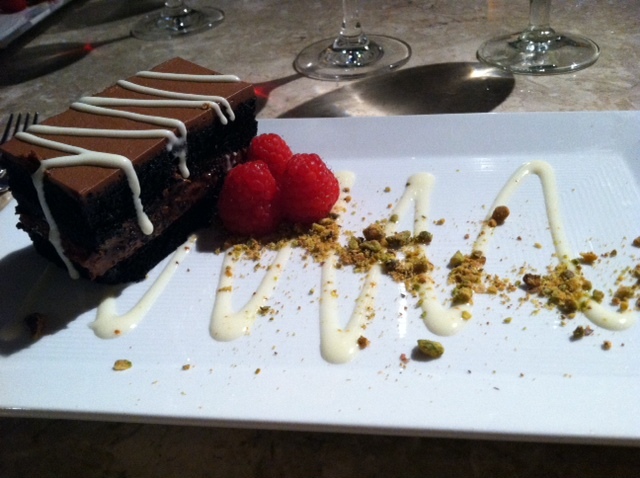 The chocolate treat was topped with white chocolate sauce and placed next to raspberries and pistachios. I’m a chocolate lover but tend to shy away from desserts that overwhelm you with it. This did nothing of the sort! It was lighter than it looks, so moist and delicious. I was thankful I didn’t have to face a heavy dessert after having that risotto. 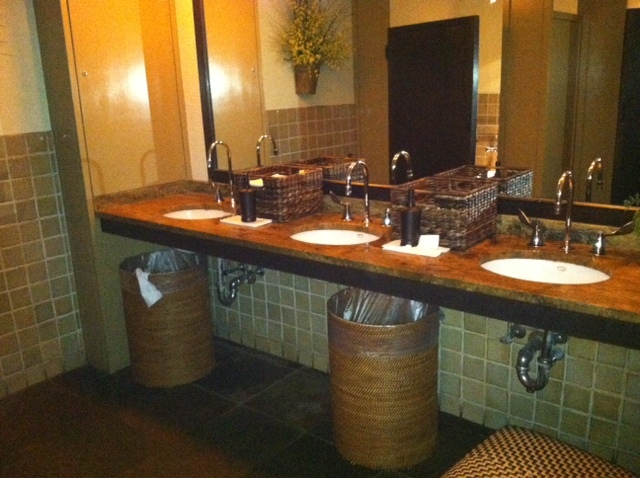 Bathroom: 3 stalls with dark brown wooden doors. The earth tones of the tile, counter, and baskets matched the overall feel and décor of the restaurant. Service: Our waiter was fine and nice but didn’t engage us too much. The first round of drinks took a longer than we would have liked but other than that we appreciated the time in between each course. Overall: The portions were small – they usually are for Restaurant Week – but I think we were better off that way. I liked the cool & comfortable atmosphere. They have a great outdoor garden patio, cozy & informal, like we were in someone’s backyard. I would definitely recommend but beware of their regular daily prices as the current cheapest entrée is $28. This entry was posted in Cambridge by Dena Raffa. Bookmark the permalink.